Senegalese acoustic music pioneer Pape Armand Boye connects with audiences through sincere, conscious artistry. A true “world musician,” he skillfully navigates the waters of this genre by retaining his own clear voice. In March 2009, a crowd of nine hundred fans sat perched on the edge of the red plush seats in San Francisco’s Palace of Fine Arts, awaiting the entrance of the Idan Raichel Project. Instead, the audience was startled by the appearance of an unanticipated feature act. Pape Armand Boye and Clifton Hyde walked calmly onto the stage, briefly tuned their guitars and then, with a natural ease, entered into a set of rich acoustic melodies that quickly won over any potential dissenters. The cavernous reaches of the Palace melted into an intimate space as the music invited audience members to lean in close and share in the simple act of two friends making music together and telling stories about life. Originally from Senegal, Boye is a composer, instrumentalist, singer, producer, and arranger who leads a busy life performing and working on musical projects in New York City, France, and Germany. 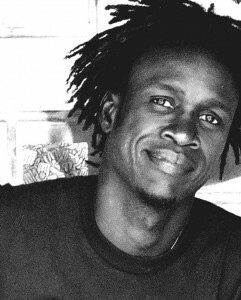 No matter where his music takes him, he remains deeply connected to Senegal where he and his brother pioneered its now-thriving acoustic music scene. His music—live or recorded—is a sincere, sensitive reflection of both his own life and of the human experience—its joys, but also its inevitable struggles. Boye grew up in the small coastal city of Rufisque on the outskirts of Dakar, where very early on he experienced the wide array of music played on the radio, including many iconic West African artists. “When my mother was cooking, I would hear Lalo Keba Drame, the great Gambian korist,” he recalls, “and the sounds of Samba Diabare Samb, the legendary Senegalese xalam player.” Growing older, he was drawn to music like the folk rock of Bob Dylan, the roots reggae of Joseph Hill, and the ballads of Jacques Brel; to songs that coupled acoustic guitar and meaningful lyrics; and to the powerful voice of Egyptian singer Umm Kalthoum. 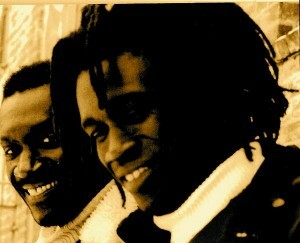 Boye’s San Francisco performance was not very far from his musical debut on television with his brother Badou in the 1990s. 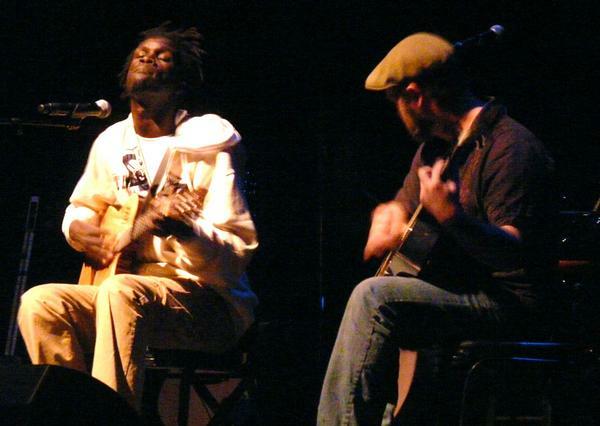 The two brothers appeared on stage with nothing but acoustic guitars and a bass—a radical departure from the large mbalax ensembles then dominating Senegal’s popular music scene. Cutting through the synthesized sounds of mbalax, they introduced a style of music they believed authentically expressed the “softer, deeper side” of Senegal. Senegalese acoustic music eventually took firm root, but not without the perseverance of the two brothers. “Even if the price to pay was high, I’m very proud of the battles we fought,” Boye emphasizes. Acoustic music coexists in Senegal today with the ever-popular mbalax and a prevalence of global music offerings. Boye views expanding to a wider music market as the next challenge for Senegal’s musicians. “There is a long way to go until our music becomes accessible to the Western consumer the way that reggae, blues, or salsa is,” he says. Communication is, in fact, at the heart of Boye’s music, and is something he strives to do with authenticity and a strong sense of self in order to better connect with listeners. His masterful guitar and clear voice lead the way through gentle arrangements of violin, cello, bass, marimba, djembe, and other instruments. On the title track of Xareba (The Struggle), his most recent album, rap lyrics even enter the mix—providing a surprising complement to mandolin. Boye carefully crafts his songs based on years of experimenting across a variety of musical styles. When pressed to categorize his music, he describes it as “new African acoustic soul,” but cautions against focusing too much on genre labels. when all you wanted was war. I see all that you’ve done. When I get there we’ll talk. It is important to Boye that his many listeners in the United States and Europe understand his songs. His albums provide translations of the Wolof lyrics into English and French, and during live performances, Boye pauses between songs to explain their meaning. Boye and Hyde will bring their onstage musical chemistry to an all-acoustic album coming out later this year. Originally from Mississippi, Hyde exhibits virtuosic mastery of numerous stringed folk instruments, including guitar, banjo, ukulele, mandolin, and zither. He dazzled the Palace of Fine Arts audience playing Boye’s compositions on steel guitar, and this album promises to be no less exciting. In addition to his longtime collaboration with Hyde, Boye often performs and records with a full band, as he did with Xareba. He and the band are currently hard at work to produce a new album by spring 2012, one that will feature Boye’s uniquely personal songs with a backing of innovative string and percussion arrangements. Palace of Fine Arts photo by Joolimei. All other photos courtesy Pape Armand Boye. This entry was posted in Feature and tagged Acoustic, Folk, Guitar, Senegal, United States, West Africa, World. Bookmark the permalink.